I have to admit that I thought I had hit upon an unconsidered topic, but I was wrong. BBC Radio 4 broadcast ‘Frontiers’ (Wednesday 21st Nov, 2100), where they ran through a lot of the topics I was considering. The programme was supposed to be discussing whether mankind had started a new geological age – Anthropocene – and also what intelligent life in the future (assumed to be other than human) would find. This is the page from the BBC web site, which gives more details, and allows listening again – for at least a year, so it says. The Golden Fleece – it doesn’t look good. 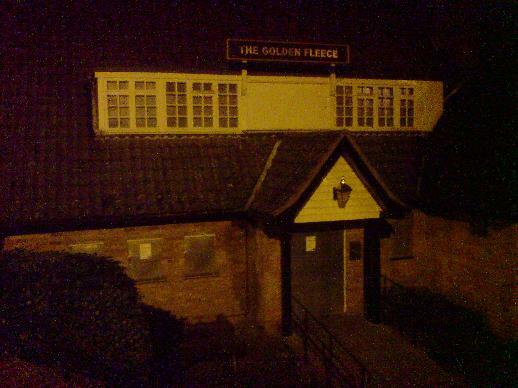 It was after dark when I passed the ‘Golden Fleece’ today, and there has been a significant change. 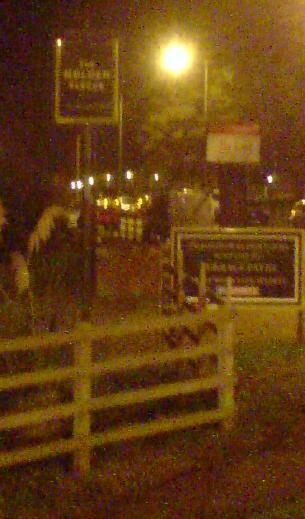 For the past couple of months there have been a car or two in the car park, but it clearly was closed. Maybe there was a caretaker in residence. But this evening (and as the clocks went back last weekend, it was now dark, hence the poor photos), the place had been boarded up in the modern manner, namely sheet metal over all the windows on the ground floor. Why they did not do the upper floors, which are vunerable to the stone throwers, I don’t know. Boarded up – modern style. It doesn’t look good for the ‘Golden Fleece’. So it is clear that the freeholder (no doubt a ‘Pubco’) of this pub has no hope of a new tenant of the place in the near future, even though the ‘To Let’ sign remains (I like the comment that the new tenant requires capital prominant on the sign – yes, wouldn’t they like to take that as soon as possible). The next nearest pub is about half a mile away (yet in other areas there are still pubs literally next-door-neighbours that both survive), and while it is not in an ideal location, it clearly had a hinterland to survive until now. I believe that within a mile of this location there are only three surviving pubs – The Dolphin, The Wanderer and The Terriers (although this may be beyond the mile). The Dolphin is moving into Gastropub territory, but as a large building, it has the room. The other two are still in the more traditional pub mould still.